Back-up equipment systems provide muck transport, personnel and material conveyance, ventilation, and utilities. A TBM is a system that provides thrust, torque, rotational stability, muck transport, steering, ventilation, and ground support. In most cases, these functions can be accomplished continuously during each mining cycle. 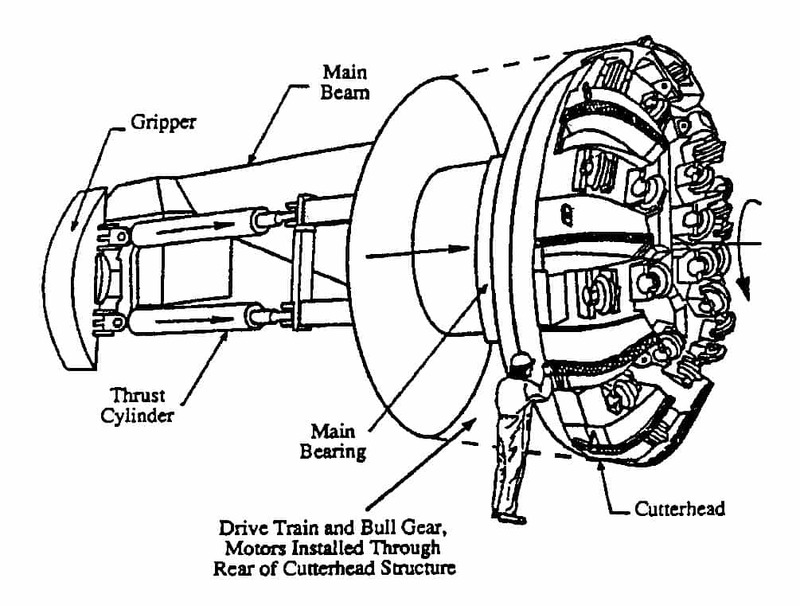 Figure shown is a sketch of a typical open or unshielded TBM designed for operation in hard rock. The T BM cutter head is rotated and thrust into the rock surface, causing the cutting disc tools to penetrate and break the rock at the tunnel face. Reaction to applied thrust and torque forces may be developed by anchoring with braces (grippers) extended to the tunnel wall, friction between the cutter head/shield and the tunnel walls, or bracing against support installed behind the TBM. PR is often calculated as an average hourly value over a specified basis of time (i.e., instantaneous, hour, shift, day, month, year, or the entire project), and the basis for calculation should be clearly defined. When averaged over an hour or a shift, PR values can be on the order of 2 to 10 m per hour. The PR can also be calculated on the basis of distance mined per cutter head revolution and expressed as an instantaneous penetration or as averaged over each thrust cylinder cycle or other time period listed above. The particular case of penetration per cutter head revolution is useful for the study of the mechanics of rock cutting and is here given the notation PRev (penetration per revolution). Typical values of PRev can be 2 to 15 mm per revolution. 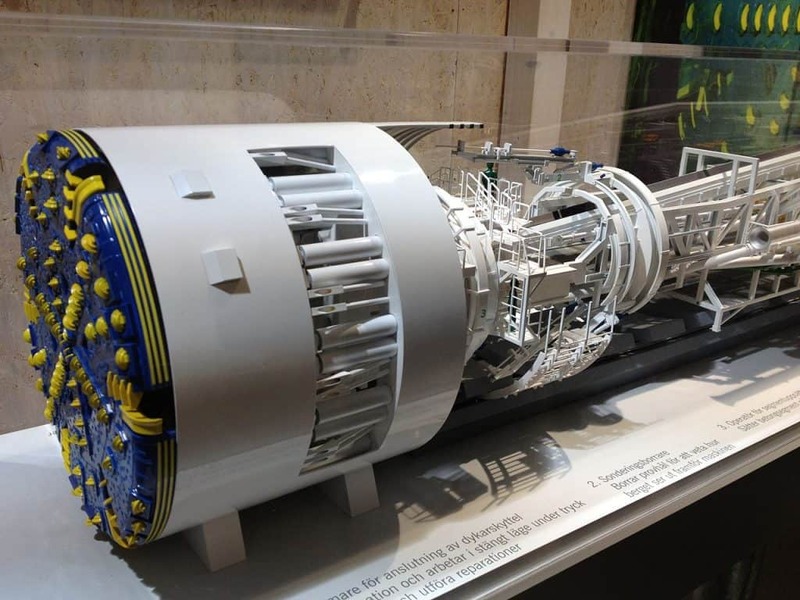 Model of the tunnel boring machine (TBM) Åsa used to dig and line the Hallandsås tunnel. The percentage of shift time during which mining occurs is the Utilization, U, and is usually evaluated as an average over a specified time period. It is particularly important that U is reported together with the basis for calculation—whole project (including start-up), after start-up “production” average, or U over some other subset of the job. On a shift basis, U varies from nearly 100 percent to zero. When evaluated on a whole project basis, values of 35 to 50 percent are typical. There is no clear evidence that projects using a reconditioned machine have a lower U than projects completed with a new machine. Utilization depends more on rock quality, equipment condition, commitment to maintenance, contractor capabilities, project conditions (ent1Y/access, alignment curves, surface space constraints on operations), and human factors (remoteness, underground temperature, and environment). If U and PR are expressed on a common time basis, then the AR can be equated to. Advance rate can be varied by changes in either PR (such as encountering very hard rock or reduced torque capacity when T BM drive motors fail) or in U changes (such as encountering very poor rock, unstable invert causing train derailments, or highly abrasive rock that results in fast cutter wear). CR is defined as the volume of intact rock excavated per Limit TBM mining time. Again, the averaging time unit must be defined clearly, and typical values of CR range from 20 to 200 m3 per TBM mining hour. Important project features that indicate use of T BM include low grades (cc-3 percent preferable for tunnel mucking and groundwater management) and driving up hill. A minimum grade of 0.2 percent is required for gravity drainage of water inflow. Horizontal curves in an alignment can be negotiated by an open TBM with precision and little delay if curve radii are on the order of 40 to 80 m. Most shielded TBMs and back-up systems are less flexible however, so that a minimum radius of 150 to 400 m should generally be used for design purposes. Tighter curves should be avoided or planned in conjunction with a shaft to facilitate equipment positioning. Experience indicates that tunnel depth has little Impact on advance rates in civil projects, providing that the contractor has installed adequate mucking capacity for no-delay operation. Therefore, tunnel depth should be chosen primarily by location of good rock. Portal access, as opposed to shafts, will facilitate mucking and material supply, but more important is that the staging area for either shaft or portal be adequate for contractor staging. Confined surface space can have a severe impact on project schedule and costs. For long tunnels, intermediate access points can be considered for ventilation and mucking exits. However, assuming the contractor has made appropriate plans for the project, a lack of intermediate access may not have a significant impact on project schedule. 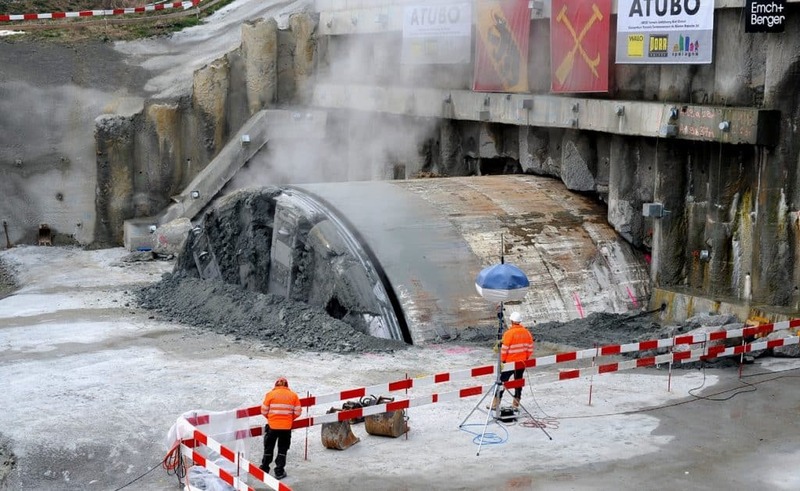 In planning a project schedule, the lead time needed to get a TBM onsite varies from perhaps 9 to 12 months for a new machine from the time of order, to perhaps 3 to 6 months for a refurbished machine, and to nearly no time required for a direct re-use without significant repairs or maintenance. With proper maintenance, used T BMs can be applied reliably, and there is little need to consider specifying new equipment for a particular project. T BM cutter heads can be redesigned to cut excavated diameters different by I to 2 m, but the thrust and torque systems should also be modified accordingly. With delivery of a TBM onsite, about 3 to 6 weeks will be required for assembly, cluing which time a starter tunnel should be completed. The start of mining rarely occurs with the full back-up system in place. Decreased advance rates on the order of 50 percent less than for production mining should be expected for the first 4 to 8 weeks of mining, as the back-up system is installed and the crew teams the ropes of system operation. 4 General considerations for TBM application.